You must be a member of the Copenhagen A Different Beat Group to attend this activity. Would you like to join this group? THE OHNOS from Malmö play catchy powerpop/punk garage rock with a morbid twist. The members of The OhNos have been around since Protected content , playing garage-flavoured punk pop, infused with handclaps, whistles and morbid lyrics. They have been appreciated for their energetic live shows, their catchy singalong tunes and their way of combining sixties garage with 70's punk rock and 90's indie. 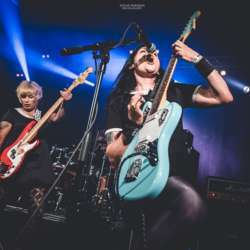 They have been compared to the likes of Ramones, Pixies, Sonics, Yeah Yeah Yeahs, PJ Harvey and the Runaways – which is a good indication of their broad musical influences!